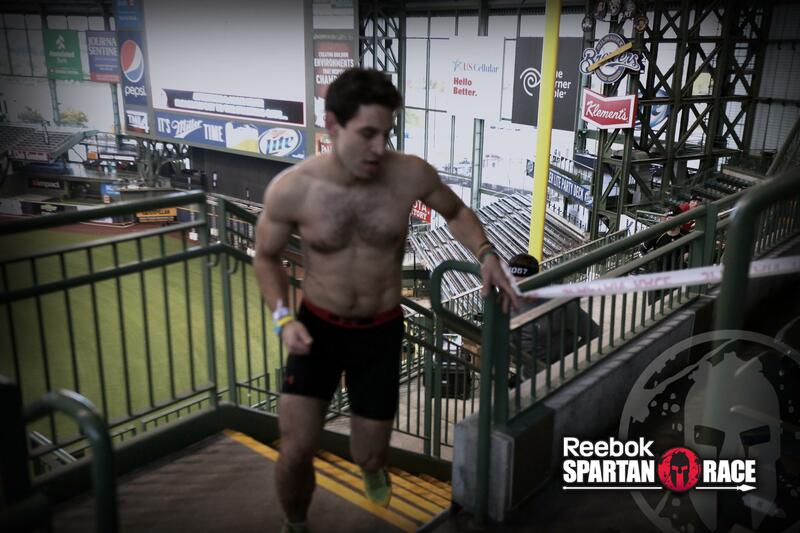 Entering the Miller Park Stadium I could sense that this was not like your ordinary Spartan Race. 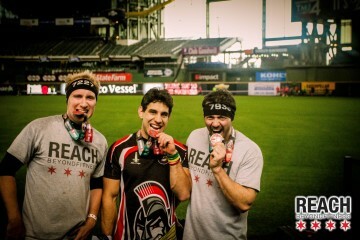 It was unlike any other Spartan Race event I have attended. It just felt different. I arrived around 7:00AM and had to do a lot before it was time to race. I went straight to bag check and started working on stretching out and contacted my father to see how long it’d be until his arrival. Sarah Pozdol and I made our way over to registration to make sure we were properly registered for being on Corn Fed who had an astounding 316 people cross the finish line this weekend. Around 7:30AM I met up with all the Corn Fed Spartans that made it in time for the group photo, had that taken. Then I finally met up with my dad with only a few minutes left to get ready. So I handed him the rest of my ABB Performance Speed Stack Pumped N.O. (my now go-to pre-race fuel) and sped off into a quick jog. I didn’t have much time and basically headed straight to the starting area. I situated myself and went off with the second wave they sent out. 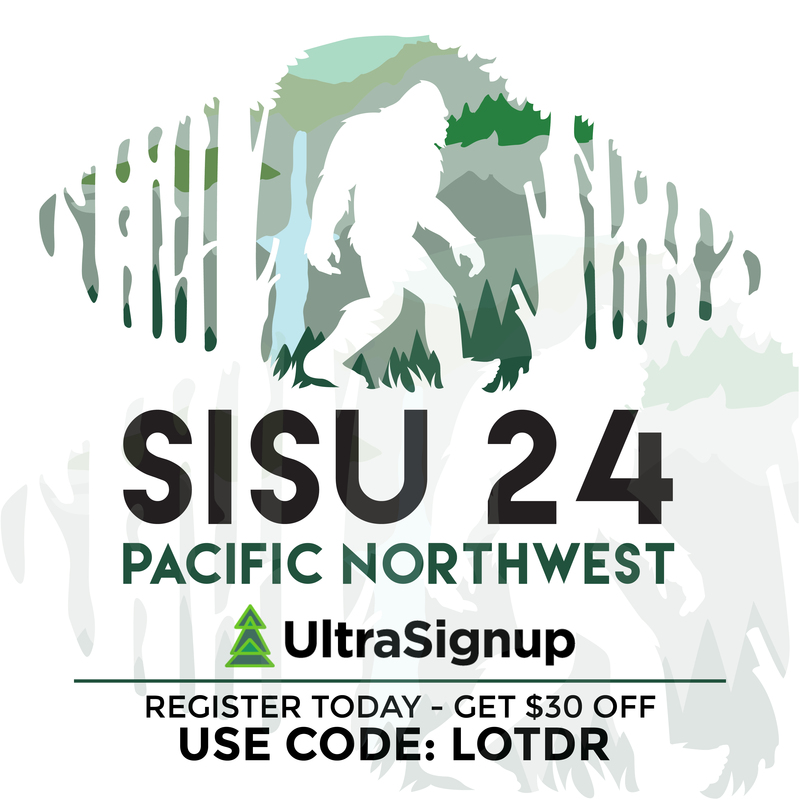 Unlike a normal Spartan Race this one requires waves of 15 every to be sent out every 60 seconds to keep the flow going and to prevent too many bottle necks from happening. Going into this race I haven’t trained as much as I had for many of my other races this year. Since Fuego Y Agua running has been non-existent from my training regimen. I’ve neglected it. Not because I wanted to, I actually kind of miss running. Since moving to the city of Chicago I find it harder to get out and lose myself to the sounds of my Spotify account and the rapid movement that I had started to enjoy. Without trails I feel a bit lost. The Miller Park Sprint acted as an excellent catalyst for forcing me to embrace an alternative training grounds from the great outdoors that I’ve grown so fond of. Right out the gate we were headed up a concrete incline ramp that lead to the next floor of the stadium, with each half floor we went up we were either greeted with a set of bungees we had to bear crawl under or skip over without tripping. It was a great way to start spreading out the competition and in my wave I was holding between top two and three for a while. The race was very fast paced, it brought you up and down staircases, around the perimeter of the park, inside and outside, challenged by most of the standard Spartan Obstacles that would be at any other Sprint, Super or Beast and then there were unique obstacles that are exclusive to the Stadium series. One of the first Stadium obstacles I encountered was the slam balls, you had to bring a 25lb slam ball over your head and slam it to the ground 30 times before continuing on your way through the course. 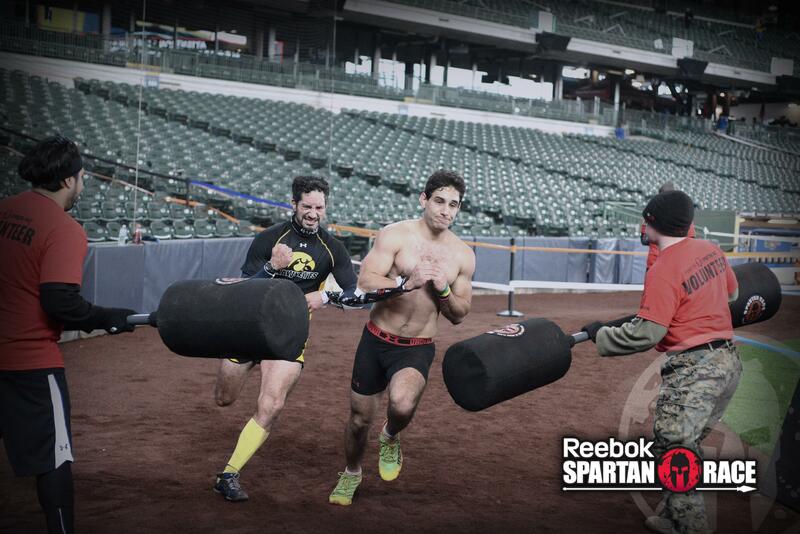 The Stadium specific obstacles were derived from Spartan Group X workouts and served as a great addition to the race mix. The exercises were very effective in breaking you down and giving you that feeling that all Spartan Races inflict on those who finish the course. Accomplished. 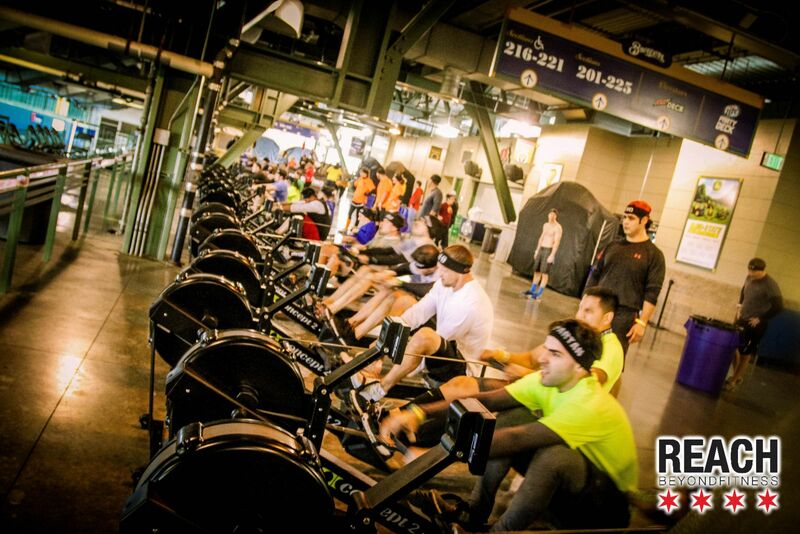 The one Stadium Obstacle that really got me was the Concept 2 Rowing Machine. At this obstacle you are required to row 500m in under 2 minutes. A task that I’ve done many times before on my father’s rowing machine. What I didn’t account for and didn’t realize until after running additional laps of the race was the resistance varied from machine to machine. If you didn’t have yours set high enough if didn’t matter how hard or how fast you rowed because you were going that much less distance per row. As I yanked away as hard as I could, feeling my legs begin to cramp I saw the dreaded Burpees screen pop up with only 2m left to row. I was shocked. How did this happen to me? Do I really have to do effing burpees right now? To say I was pissed in an understatement. 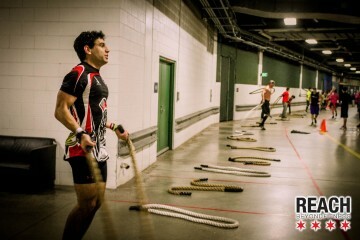 Going into my burpees I was completely gassed. I’ll be honest I hope I did enough because counting out loud wasn’t working, my head was spinning. Nauseous? Check! Ya, these were probably some of the worst burpees ever. I’m sorry to those of you who saw these on the big screen. It was not my best but it was all I could give without collapsing. You see going into this race I made myself a promise. No matter what happened I was going to push myself as hard as I have even though my training has been lacking. Most races I have finished and I have been able to throw my front flip over the fire at the end. Knowing there wouldn’t be any fire here I wanted to just push it to the limit. I wanted to see how far I could really go. I wanted to see if I could make it into the top 10 with all the tough competition that showed up. I believed I could and wanted to prove that to myself. I had to keep going. After finishing those dreadful burpees I continued on and dominated the looming 8′ wall that came after the long row of garbage cans. They were clearly there in anticipation of how people might react to the Rowing Machine obstacle. Other new challenges and obstacles here included 20 chest-to-floor hand release push-ups, 50 heavy jump ropes, and a jug carry. It was refreshing to have the standard Spartan obstacles like the hercules hoist, traverse wall, and Spear throw and a waterless rope climb there to make me feel like I was still running a Spartan Race even though I was not out in the wilderness, in the middle of nowhere like I am used to. I really enjoyed the way this race ended, you came off the cargo net, went to the hercules hoist, hit the rope climbs in the center of the outfield’s perimeter, from there you were essentially home free just a quick set of box jumps and it was a sprint to the finish. I hit it hard at the end trying to push myself all the way. After finishing it took me awhile to collect myself. I felt very sick, coughed a lot, and spit up a little liquid vomit when I made it to the bathroom. I had to wash myself off before returning outside to see how I finished. I finished my first Stadium Spartan Race in 38:53. While I am happy with myself for pushing hard than I have before I do have to make myself change my training, it’s time to get my running back in check. Knowing how long it takes to do burpees and how pathetic mine were it’s safe to say I could have made it into top 10 territory. I’m coming to Fenway with a vengeance. As some of you know by now Joe Kauder is my “Double Dragon” brother. Given that I had a spontaneous idea to try doing a tethered heat. I’ve been wanting to try it ever since hearing about others that had done it before. It sounded like a unique challenge and who better to do it with than my Double Dragon brother whom I usually only run 2-3 minutes slower than at almost every race we do together. We’re very close in size and capabilities so it seemed like a no brainer. If anything it would be a great way to push each other to test our limits. It didn’t take too much arm twisting to get Joe to sign on board. We secured two bandanas and each tied one to our non dominant wrist, mine being my right arm and Joe’s left. This gave us the freedom to use our dominant arms without limitation, you cannot imagine how awesome it is that Joe was a righty and that I am a lefty but I’ll try to paint you a picture. Going into this heat was fun, just before things got started I ran into a few of my friends, Ilya and Kostya and we all started in the same wave. Joe and I took the lead and seemed to be acting in perfect sync right off the get go. There were a few things we hadn’t thought of going into this that we would have to overcome as we encountered them. For instance when we reached the Over-Under-Through it became clear that everything wasn’t going to be done side-by-side during this heat. So Joe would go in front or I would crawl through first. At first there was some hesitation but we got into a rhythm fairly quick and started discussing our plan of attack as each new obstacle came into our sights. When we reached the Concept 2 Rowers I knew exactly what to do before starting that timer, I adjusted my resistance up to 8 or 9 of 10 levels and then Joe and I started together and we rowed as if we were one. It was something incredible that I cannot even begin to explain. The amount of energy and power we were unleashing on these rowers was like something you’d see in an anime. Glowing aura’s all around us, extremely loud and aggressive grunts and groans fueled by testosterone, veins clearly visible and pulsing through your skin. Less than 2 minutes later we saw the glorious AROO! unlatched our feet, let out a loud AROO!! ourselves and took off making our way in and out of the course like it was nothing. in the hay. Joe and I let out some loud yelling to show our excitement for both hitting the spear throw and we continued on to the last few sections of the race.When we got to the Heavy Jump Ropes we actually had to untie our bandanas because if we tried to jump with them tied they would begin to get tangled with the heavy ropes. As soon as we finished we fixed our tether and set out on the last few obstacles. As we approached the rope climb I was starting to feel a huge burst of energy overcoming me. It came out of no where but it felt great. 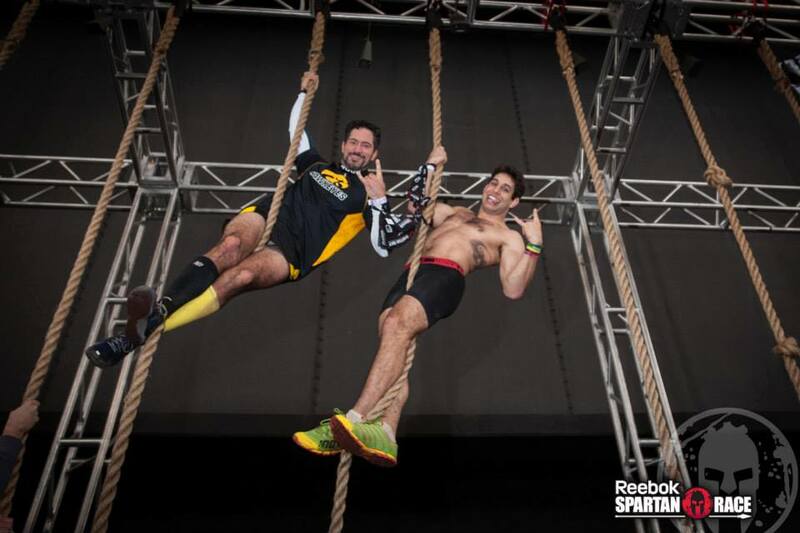 Joe and I climbed our way to the top of the ropes and together we kicked our outside legs up rang the bell in epic Double Dragon style and continued on to finish the last obstacle of the course. 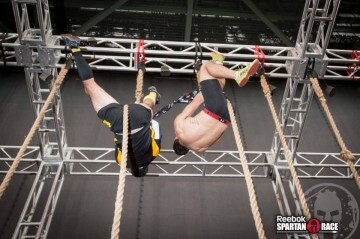 As soon as we finished the box jumps I wanted Joe and I to finish as hard as we possible could so I set the pace. Rounding the corner we plowed through the gladiators and that’s when I realized I had turned the gas on a little too hard. I looked back and saw Joe rolling on the ground, I took that corner way too fast. I’m sorry big bro. I got a little bit excited about our finish. Running this race tethered to my pseudo brother was such an awesome experience. Working together to accomplish obstacles, pushing each other to run harder, figuring out ways to run along the bleachers, dipping, ducking, dodging, it was a really interesting way to run a race and I look forward to toying with more unique ways to tackle these races that I absolutely love to do. As always I made sure to jump in and rabbit a lap of the Kids Race. Joe and I lined up and got the kids pumped up. I got them all yelling AROO! Asking them to give it louder each time. The greatest announcer there is, T.C., came over and got things rolling. Joe and I were in the ready position for what seemed like forever when finally T.C. said GO and those kids came running after us faster than any I’ve ever seen. We had to push it hard just to keep up with the leaders. Joe took the lead male and I the lead female. The lead females leader, Mackenzie, destroyed this two lap, one mile course. It was mostly running with only a series of walls and over-under-throughs at the end of each lap for obstacles but the uphill climbs were pretty demanding and these little ones just never stopped pushing. It was so fun seeing them finish. Rabbiting and seeing the next generation of Spartans being brought up with such a healthy lifestyle, and parents who are leading by example, it’s a very comforting sign that people are moving in the right direction. The Spartan way of life really is about building better humans. Healthier, happier humans. Some how after all this I still had just enough energy to grab my Canon DSLR run over and say hi to a few friends from high school, and jump in a wave with my guys from the gym, Charlie, Adam, and Kyle. 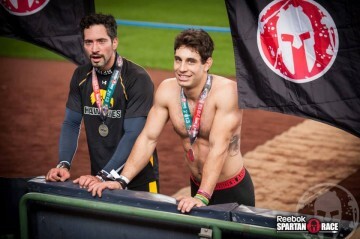 I figured this would be great to capture them during their very first Spartan Race so they could be guaranteed a bunch of photographic memories. You can’t always expect to get the best pictures from the automatic photo systems and the few photographers they have on the courses so having a personal photographer guarantees you have those epic facebook profile photos. Running with them was an awesome experience, Charlie has been training hard to get back in shape and you it’s really paying off. Kudos to you Charlie. Adam was able to have a great time and pushed himself harder than he has in a long time. After the race I received a text message that they both wanted some more of the kool-aid. It’s pretty damn good. I know, I’ve been drinking it for two years now. While on the course I saw Danny Rodriguez running his third lap as well. He’s been working hard with us at REACH to achieve his goals and I am so proud of him for never giving up. After running the race three times plus the kids race I was spent. Festival Challenges are the one thing that was missing from the event other than that I must say the Stadium Races are top notch and I cannot wait until Fenway.